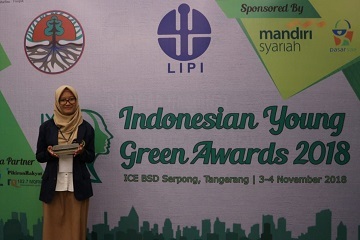 Student of Bogor Agricultural University (IPB), Yeyen Laorenza won 3rd place in the 2018 Indonesian Young Green Award held by the Indonesian Institute of Sciences (LIPI) and the Ministry of Environment and Forestry of the Republic of Indonesia (KLHK RI), Saturday (4/11). This award was given by the Minister of LHK RI, Dr. Ir .iti Nurbaya Bakar, MSc for research and innovation in green technology. Yeyen brought the work entitled "Advanced Biofoam Materials with Starch Based on Composite Microcapsules of Fish Oil and Nanocarbon Active Fish Bone Phases". Biofoam is made to replace Styrofoam, which is currently one of the sources of garbage accumulation problems that are difficult to overcome naturally. Biofoam raw materials that use fish processing waste are other positive values ? ?that make it one of the green technology innovations. The addition of activated nanocarbon composites causes the resulting biofoam to have high thermal conductivity so that it is safe to use directly when heating food in the oven. The main principle of making biofoam is carbon activation, pyrolysis to purify and then mix with tapioca starch and printing. According to Yeyen biofoam, it can be degraded by water for less than three hours, so it is considered environmentally friendly. Research on Advanced Biofoam Materials is the result of his thesis research which was guided by Bambang Riyanto, SPi, MSi and Dr. Eng. Uju, SPi, MSi. This study lasted eight months in 2018. "The struggle to get this biofoam formula is inspired by Marine Debris or high marine water waste as the trend of using plastic also increases. Substitutes for natural-based plastics, especially from potential starches, will be developed, because starch itself is a polymer, as is plastic. "The advantage of biofoam is the improvement in its thermal stability using phase change material in the form of fish oil with epoxidation technology and active nanocarbons sourced from fish bones," he said.